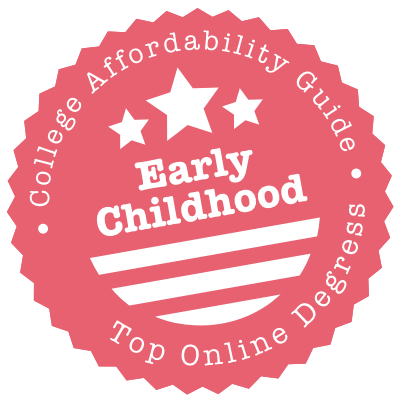 Scroll down to see the top not-for-profit colleges offering early childhood degrees online. The Master of Education in Early Childhood Education degree available at Albany State University is a 36-credit hour program that can be completed online. Applicants must have a bachelor's degree in early childhood education or an equivalent academic credential from an accredited institution. Those with insufficient background may be required to complete additional course requirements before starting the M.Ed. program. The curriculum includes a wide range of courses that cover topics such as cultural diversity in early childhood education, parent involvement, diagnosis and remediation, and theories, design, and program development in early childhood education. The M.Ed. program leads to the T-5 Certificate of Early Childhood Education. Graduates who hold this certification can work with children from Pre-K to Grade 5. Arkansas Tech University offers an online Associate of Science (AS) degree in early childhood education that is approved by the Higher Learning Commission of the North Central Association of Colleges and Schools. Although the program does not lead to public school teaching licensure, it nonetheless prepares students for careers in child care or in early childhood education in a public or private learning environment. The curriculum includes coursework that explore a wide range of topics in the field such as the role of family, culture, and community in childhood education; health, safety, and nutrition guidelines; developmentally-appropriate classroom practices; and early childhood education curriculum design and implementation. AS credits transfer readily to four-year programs offered online or on-campus at large universities. Students accepted to the Bachelor of Arts in Early Childhood Education degree at Brandman University have the option of completing the program entirely online or through a combination of online and on-campus classes. The curriculum is based on the California Early Childhood Educator Competencies and the Professional Preparation Standards for Initial Licensure of the NAEYC (National Association for the Education of Young Children). Applicants for both the online and on-campus programs must be California residents. Students enroll in classes that cover topics such as teaching in a diverse society, child growth and development, curriculum for young children, and health, safety, and nutrition. In addition to the course requirements, students must complete field work and a capstone project in order to graduate. The online Bachelor of Arts degree in early childhood studies offered at California Baptist University (CBU) prepares students to work with both disabled and non-disabled children from birth to eight years of age in various educational settings. Students must complete 33 credits of upper division coursework. The curriculum includes courses in cognitive development in infancy and early childhood, consultation and collaboration in early childhood intervention, and learning environments for young children including children with disabilities. CBU also offers an online Master of Science in Education degree with a specialization in early childhood studies. Students who complete the 33-credit program are equipped with the practical skills required in areas such as curriculum development, program implementation and evaluation, and employee management and supervision. Central Carolina Community College offers two online certificate programs in the field of early childhood education - the Early Childhood Credential - Family Home & Early Childcare Certificate and the Early Childhood Associate Credential - Infant/Toddler Care Certificate. The early childcare certificate consists of 18 credits and is comprised of courses in health, safety, and nutrition; math and science activities for young children; child, family, and community; and literacy experiences. The certificate on infant/toddler care is a 16-credit program that prepares students to work with children from infancy to age three in a variety of educational settings. Credits earned for each of these certificates are transferable to an Associate in Applied Science degree in early childhood or an early childhood diploma. The Associate of Science in Early Childhood Education offered at Clarion University is an online-only program that can be completed on a part-time basis. This 60-credit degree is comprised of 29 General Education and 31 Early Childhood Core credits. Clarion University also offers an online Master of Education in Education degree with a concentration in early childhood. Child care directors can take the nine-credit Early Childhood Directors Program online. The three courses that comprise this program are the following: Curriculum Bases for Learning and Teaching, Child Care Management and Administration, and Leadership in Early Childhood Settings. The online Graduate Certificate in Early Childhood Education is designed for students with Pennsylvania elementary certification who wish to earn a Pennsylvania early childhood certification. Fayetteville Technical Community College offers an Associate in Applied Science degree in early childhood that prepares students to work with young children in a variety of educational settings. The program can be completed online. By following a full-time plan of study (15 credits per semester), most students can expect to earn the degree in five semesters. The program consists of 66 credits and includes courses such as child development, introduction to early childhood education, communicating with parents and children, creative activities, and health, safety, and nutrition. Students are also required to take introductory classes in psychology and sociology, as well as in computer basics and in educational technology. The completion of a capstone project is a requirement for the degree. Florida International University offers a Bachelor of Science in Early Childhood Development degree that can be pursued entirely online. Students enroll in classes that give them the opportunity to study areas such as educational psychology, early social and emotional development, and special needs of children and families. Of the 120 credit hours required for the degree, 30 credits hours must be comprised of professional education courses that focus on foundations, teaching methods and curriculum, and early childhood education. Courses are offered asynchronously, allowing students to access them at any time and from anywhere. Although the program does not lead to teacher certification, it prepares students for careers in early childhood education as well as for continued studies in the field. Front Range Community College offers an Associate of Arts in Early Childhood Education (ECE) degree that can be completed online. The program is designed primarily for students who plan to transfer their AA credits towards a four-year bachelor's program in a large university. The 60-credit program can be completed in four or five semesters. In addition, the college currently offers the following online certificates: Early Childhood Director Certificate (31 credits), Infant-Toddler Nursery Supervisor Certificate (12 credits), Foundations of Early Childhood Education Certificate (16 credits), and the Early Childhood Education for Para-educators Certificate (21 credits). The first three programs meet the Colorado Department of Human Services (CDHS) requirements for certification in the respective program fields (ECE Director, Infant-Toddler Nursery Supervisor, and ECE Teacher). Haywood Community College offers an Associate in Applied Science degree in early childhood education (ECE) that can be pursued online and trains students to work with very young children in a variety of learning environments. The program can be completed in four semesters and offers two tracks - early childhood education and early childhood education administration. The ECE curriculum includes coursework in that cover topics such as child, family, and community, child development, educational technology, and health, safety, and nutrition. Haywood also offers ECE certificates online. The 17-credit Certificate in Early Childhood is available in two areas - infant/toddler and school-age education. Students can also complete a Certificate in Early Childhood Education (17 credits) and a Certificate in Early Childhood Administration (14 credits). The Associate of Applied Science degree in early childhood education available at Ivy Tech Community College is a hybrid program that includes both online instruction in a virtual classroom as well as regular on-campus visits. The program is comprised of 60 credits and can be completed in four semesters. Students who earn the degree are prepared for immediate employment after graduation (for example, as lead teacher, family life specialist, community program director, etc.). The AAS degree also transfers readily to a four-year bachelor's program in a related field available in large universities. The curriculum includes coursework that tackle essential issues in early childhood education today, such as developmentally appropriate guidance in cultural context, families in transition, cognitive curriculum, and the exceptional child. The Associate of Arts in Early Childhood Education degree at Liberty University is 60-credit program that can be pursued entirely online. A student's prior learning and professional experience may be assessed for academic credit and applied toward the degree. No practicum is required for completion of the program. Liberty also offers an online Bachelor of Science in Early Childhood Education Interdisciplinary Studies degree. The program provides students with foundational knowledge of early childhood behavior and educational development from a Christian perspective. Early childhood education is offered as an area of specialization in the Master of Education in Teaching and Learning program. Students interested in early childhood education licensure through the M.Ed. program must already possess an initial teaching license in elementary education. Mercy College offers a Master of Science in Early Childhood Education, Birth - Grade 2 degree that can be completed online. The program prepares students for initial New York State certification. Students must accrue at least three years of professional experience and take additional courses in order to be eligible for permanent certification. The 39-credit curriculum includes courses in a variety of topics that are essential in the field of early childhood education today. Some of these are: cultural perspectives in the teaching and learning process, foundations of education for students with disabilities, working with parents and families, and language development and literacy education. Transfer credit is limited to six semester hours from an accredited program taken within the last five years. The Bachelor of Arts in Early Childhood Education offered at National University fulfills the academic requirements of the Child Development Associates National Licensing program and the State of California Child Development Permits. The program can be completed online. Students can choose from the following areas of concentration: early childhood administration, infant and toddler, and teacher education. With the guidance of a faculty advisor, students can craft a customized plan of study by enrolling in classes that support their professional goals. There is also a Graduate Certificate in Early Childhood Education available online. Students must enroll in the following courses to earn the certificate: Current Issues in ECE, Cognition and the Young Child, The Early Childhood Teacher, and Best ECE Teaching Practices. New Hampshire Technical Institute offers an Associate in Science degree with a concentration in early childhood education (ECE) through the Child and Family Studies Department. The program is available 100 percent online. The curriculum follows the standards advanced in the Guidelines for Early Childhood Education Programs in Associate Degree Granting Institutions as established by NAEYC (National Association for the Education of Young Children). The AS degree meets the education and training requirements for Level 5 of the New Hampshire Early Childhood Teacher Credential. There are two ECE certificates available online - Early Childhood Education Certificate and Early Childhood Education Advanced Certificate. Courses for both programs fulfill the training and academic requirements of the New Hampshire Early Childhood Teacher Credential Level 4. The Associate in Applied Science in Early Childhood Education: Infant - Grade 4 degree offered at Northampton Community College is a 61-credit program can be pursued entirely online. The program is accredited by the National Association for the Education of Young Children (NAEYC). Online students are required to submit a video documentation of their field experience in a pre-approved site. There is a 36-credit Certificate in Early Childhood Education: Infant - Grade 4 program that can be pursued online as well. Students can select a Specialized Diploma option that prepares them for the Child Development Associate (CDA) in three fields: infant-toddler, Pre-K, and family child care. A 15-credit Specialized Diploma option in Leadership for Early Childhood Program Directors is also offered online. Students with an associate's degree in early childhood education (ECE) are eligible to apply for the Bachelor of Applied Science in Early Childhood Education degree available at Northern Arizona University (NAU). The program can be completed entirely online, although it does not lead to state teaching certification. Students seeking certification should explore the undergraduate certificate in early childhood education. When completed in conjunction with a baccalaureate degree in elementary education, the ECE certificate leads to state licensure (K - Grade 3). The ECE certificate program is available 100 percent online, while the bachelor's program in elementary education follows a hybrid delivery system. NAU offers a Master of Education in Early Childhood Education degree that can be pursued online as well. The online Bachelor of Arts in Early Childhood Education (BAECE) degree offered at Pacific Oaks College is a completion program that requires applicants to have at least 60 credits from an accredited college or university. The program can be completed in two years. Students can fulfill their fieldwork within their geographical area in a pre-approved site. There are two additional programs that are also available online - BAECE with Preliminary Multiple Subject Teaching Credential and a BAECE with Dual Credential. The latter program qualifies students to teach general education students in different subjects and also students with mild or moderate disabilities (K - 12). Pacific Oaks College also offers Master of Arts in Early Childhood Education degree that can be pursued online as well. Pamlico Community College offers an Associate of Applied Science in Early Childhood Education (ECE) degree that prepares students to plan, implement, and assess developmentally appropriate programs in a variety of learning environments. Majority of the ECE courses can be completed online, however, General Education requirements and other elective courses may require regular on-campus attendance. Graduates are prepared to enter the workforce immediately after graduation, although AAS credits can also be transferred to four-year baccalaureate programs available at large universities. The curriculum includes foundational courses in early childhood education, such as child development, creative activities, curriculum planning, developmental psychology, infants, toddlers, and twos, and educational technology. Students are required to complete a capstone project in order to graduate from the program. Stanly Community College offers an Associate of Applied Science degree in early childhood education (ECE) that is accredited by the National Association for the Education of Young Children (NAEYC). The program is comprised of 61 credits, available online, and can be completed in five semesters. Students who earn the degree are prepared for professional opportunities in a variety of child care settings. Students can also apply their AAS credits to a four-year ECE program offered at large universities. The curriculum includes coursework in educational technology, language and literacy experiences, child guidance, and health, safety, and nutrition. The 18-credit Certificate in Early Childhood Education offers options in advanced administration and in infant/toddler care. An ECE diploma option is also available online. The James I. Perkins College of Education at Stephen F. Austin State University offers a fully online Master of Education in Early Childhood degree. The program has compressed course schedules that reduce the length of time it takes to complete a course from 15 weeks to just eight weeks, allowing students to earn their degrees in less time. The compressed course schedule provides six entry points for the program throughout the school year. The curriculum includes coursework in family, school, and community relations, psycho-social development of the child, cognitive and language development, and professional roles and responsibilities of early childhood educators. Students are not required to take a comprehensive exam or write a thesis in order to graduate from the program. Tallahassee Community College offers an Associate of Science in Early Childhood Development, Education and Management degree through the Division of Technology and Professional Programs. The degree consists of 63 credits and is available online. The curriculum includes coursework that cover a wide range of topics such as cognitive experiences for young children, early childhood development and guidance, disabling conditions in young children, and the role of home, school, and community in early childhood education. Students who hold a current Florida Child Care Professional Credential (FCCPC) or a Child Development Associate (CDA) certificate from an accredited program may be assessed credit hours for their qualifications. Up to nine credit hours from these programs can be applied toward the AS degree. The College of Education, Criminal Justice, and Human Services at the University of Cincinnati offers an online Associate in Applied Science (AAS) degree in early childhood care and education with three tracks - infant/toddler, preschool, and administration. A Bachelor of Science in Early Childhood Education degree is also available online. The program offers a specialization in children from birth to age 5. Students who complete the BS program satisfactorily may be eligible to apply for the pre-K license in Ohio. No on-campus visit is required for both the AAS and BS programs. Students who wish to earn a Child Development Associate (CDA) credential can take all the courses online. The CDA coursework offers a family child care, preschool, or infant/toddler focus. The University of Dayton offers Bachelor of Science and Master of Science in Education degrees with a concentration in early childhood leadership and advocacy. Both programs are available online. Students interested in the bachelor's program must already hold an associate's degree in early childhood education from an accredited institution. Professional experience can be assessed for up to 12 semester hours and applied towards the degree. Students accepted to the master's program complete a common set of core requirements before concentrating in either the administration strand or the advocacy strand. There are two professional certificates in early childhood leadership available online - one on the undergraduate level and another on the graduate level. Each certificate is comprised of 21 credits. The University of Wisconsin at Steven's Point offers an online Master of Education degree with a focus on early childhood education (ECE). The program is comprised of at least 30 graduate-level credits, 21 of which must be taken from the list of approved courses for the student's area of specialization. Students must earn the degree within seven years of initial enrollment, however, most students graduate from the program in three years. There is also an online ECE Add-on Certificate for applicants who already hold a current license for Grades 1-6 or for Grades 1-8. The add-on certificate extends their certification to the Kindergarten and Pre-K levels. The program is comprised of 14 credits and can be completed in two summer terms. Wake Tech Community College offers an Associate in Applied Science degree in early childhood education that can be completed online. The curriculum includes coursework in classroom management and instruction, child development and guidance, and early childhood administration. Students admitted to the program must take two practicum courses in a program accredited by the National Association for the Education of Young Children (NAEYC). An early childhood facility with a 3-star license will suffice in lieu of the NAEYC accreditation. Wake Tech also offers Child Development Associate (CDA) certificate programs. Only two CDA programs are currently available online - infant/toddler care and early childhood. Both programs require the completion of a practicum experience. These certificates fulfill only the educational requirements for the CDA credential. The West Chester University of Pennsylvania offers a fully online Master of Education (M.Ed.) in Early Childhood Education degree. Students accepted to the program can choose from two tracks of study: the accomplished teachers track (for certified teachers) or the program administrators track (for primary-level principals and childcare administrators). The completion of the same eight courses is required for both tracks, with two additional courses in the student's preferred area of specialization. The curriculum includes coursework in topics such as the foundations of early childhood education, advocating for young children and families, integrated curriculum and assessment, and families, communities, and education in a multicultural society. All students must complete a capstone course in order to graduate from the program. If you’re considering teacher licensure, you’ll find that most degrees require a practical component (e.g. supervised teaching). That means 100% online programs are rare. However, you’ll often discover hybrid programs that combine online courses with internships in your local area. Just make sure that they’re approved by the state. Choices usually improve at the graduate level. 100% online master’s programs and add-on certificates are much more common for those who are already certified to teach and have some practical experience under their belt.